Mirador Morro Velosa is situated on the road between Antigua and Betancuria, at only 9 km of the old capital of Fuerteventura - Betancuria. The building itself is situated on the top of Tegu mountain (montana Tegu) at an altitude of 669 m.
The view from the Morro Velosa viewpoint is breathtaking, as you can see all the way towards El Cotillo, Montana de Tindaya, the Corralejo dunes and on really clear days, you can even see a bit of Lanzarote. 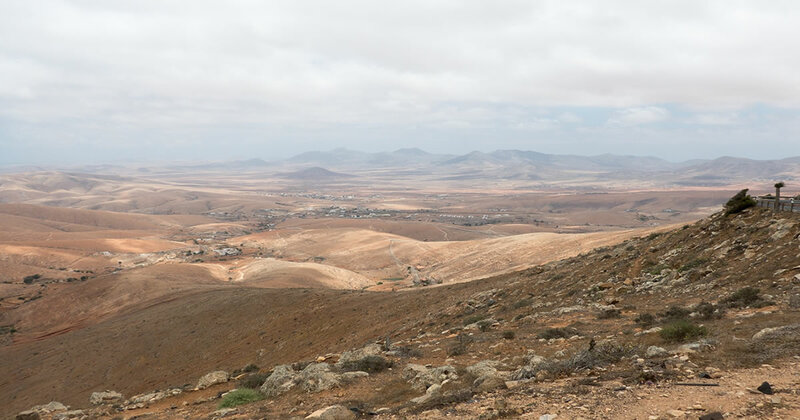 Some say this is the best view of the inland of Fuerteventura. You can check the complete list of the best viewpoints in Fuerteventura, to see what else there is to visit. If you are on your way to Betancuria, you should definitely make a stop first at this place to admire the view and maybe enjoy a cup of coffee. The entire place for designed by Cesar Manrique, the famous architect native from Arrecife, in Lanzarote and responsible for many of the attractions on the neighbor island. A beautiful garden will welcome you at first and you have to follow a set of stairs towards the observation platform. From there you can admire the entire Valle de Santa Ines, the volcanoes near Tiscamanita, the town of Antigua and all the way towards Corralejo and the north of Fuerteventura. On some days the wind here can be pretty strong, a good reminder of why the island is named Fuerteventura. Inside the building of the mirador you can find a small cafe, where you can have a snack and something to drink, while admiring the view through the amazing glass wall. After you visit the mirador and continue on the way towards Betancuria, you should also make a stop at the Morro Velosa statues: Guise and Ayose. The entrance to Mirador Morro Velosa is free. On Sundays and Mondays the viewpoint is closed. When the mirador is closed, there is a barrier that prevents the access to the road that leads to it. For this reason, you must visit only during opening hours.